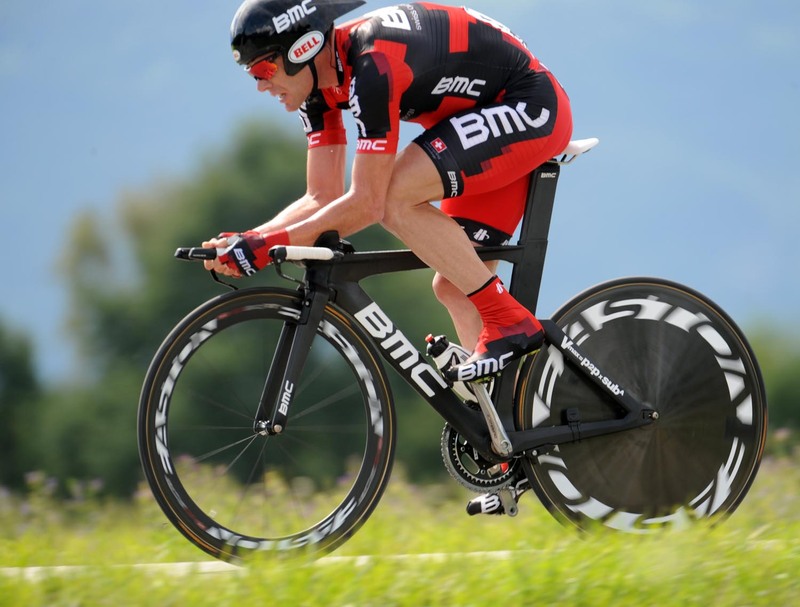 Cadel Evans (BMC) decimated Andy Schleck (Leopard-Trek) in the final time trial of the 2011 Tour de France in Grenoble today, virtually winning himself the race title with a storming performance that almost landed him the stage win too. Evans finished 2-31 ahead of Andy Schleck, giving himself a 1-34 lead over the Luxembourgean in the GC classification. He was only seven seconds behind stage winner Tony Martin (HTC-Highroad), and Evans needs only reach the finish in Paris tomorrow to make himself the first ever Australian to win the Tour de France. He was emotional as he stood on the podium, and it now looks, disasters aside, that he will finally take the prize that has eluded him on so many occasions before. Tony Martin (HTC-Highroad) took the stage with a time of 53-33, which only Evans came close to. Fabian Cancellara (Leopard-Trek), who was expected to be challenging for the stage win along with Martin, finished eighth, 1-42 down on Martin. He went of earlier than Martin, when conditions on the road were a little damper, which may have hampered his performance. His slower-than-expected time may also be due to the work he did in the Alps in aid of the Schlecks. The frailty of Cancellara’s time became clear when Richie Porte (Saxo-Bank Sungard) and then a surprise performance from Thomas De Gendt (Vacansoleil-DCM) dislodged him at the top of the leader-board. As it was, Tony Martin blew the rest of the field out of the water as he went 1-29 faster than De Gendt. Only Edvald Boasson Hagen (Team Sky) of the riders outside the GC top ten could have threatened Martin’s dominance. He ended up 2-10 down on Martin, but looked strong at the first time check and lost time after a problem with his tri-bars caused him to change his bike soon after. Contador was close at the early time checks, and rode strongly, but Martin looked untouchable until Evans took to the road. The Australian’s performance was worthy of a Tour winner, underlining the strength that he has shown throughout the Tour and showing that he is indeed the strongest of the GC contenders this year. He was only a few seconds down on Martin for most of the course, possibly spurred on by his dreams of yellow, and Martin admitted afterwards to being nervous as he watched Evans on the TV screens at the finish. Indeed, the advantage that Evans takes to Paris is largely a reflection of the strength he showed over the 42.5km course rather than an unexpectadly poor performance from Andy Schleck. Schleck never looked particularly comfortable and haemorrhaged time to Evans throughout, but his time was only about one and a half minutes slower than the likes of Contador, and he came in in 17th position. Pierre Rolland (Europcar) held onto the white jersey, losing time on Rein Taaramae (Cofidis), but finishing 46 seconds ahead of him overall. The French rider, who picked up his first stage win yesterday with a sensational ride to Alpe d’Huez, has some time trial pedigree, and although Taaramae was consistently up on him at the intermediate checkpoints, he managed to limit his losses and only lost 0-47 to the Estonian in the end. In the GC top ten there was little change outside the obvious change in the top three. Alberto Contador’s (Saxo-Bank Sungard) strong performance gave him third place on the stage at just over one minute behind Martin, but his gains were not enough to threaten either Thomas Voeckler (Europcar) or Frank Schleck (Leopard-Trek) in the overall standings. Frank Schleck finished 20th, 2-41 down, but with Thomas Voeckler only going 27 seconds faster than him, he held onto his podium place. 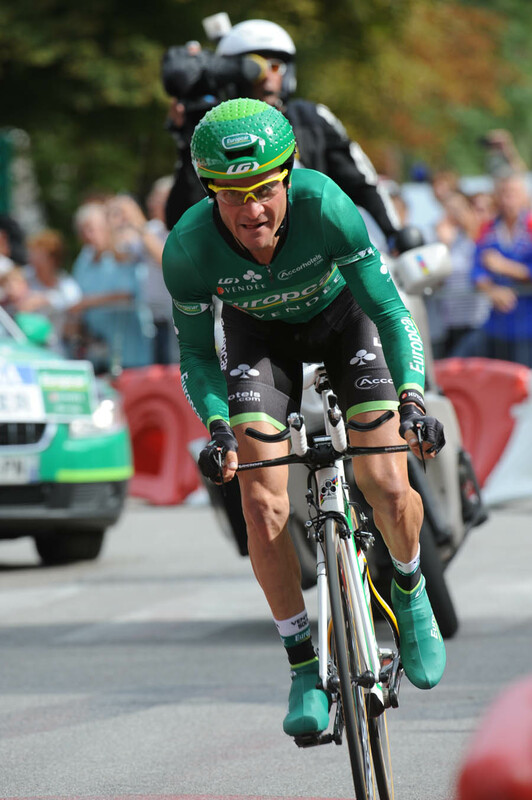 Though Voeckler did not do enough to threaten Schleck, he did hold off Contador, finishing with a 27-second cushion on the Spaniard. A strong performance from Samuel Sanchez (Euskaltel-Euskadi), saw him move up one place to sixth overall, as Daminano Cunego (Lampre), who is not a noted time trialling talent, fell to seventh. Tom Danielson (Garmin-Cervelo) held onto ninth position, while a strong performance from Jean-Christophe Peraud (AG2R-La Mondiale) saw him leap-frog Pierre Rolland into the top 10. 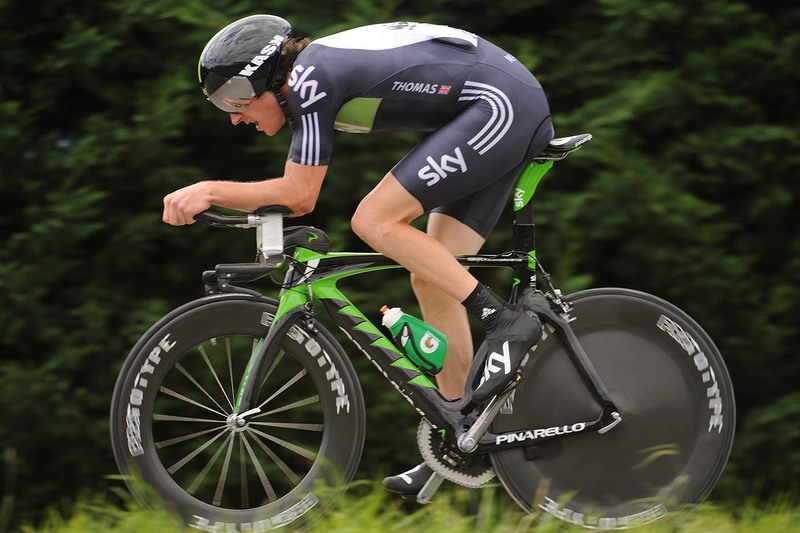 It was tough going for the two Brits whose time trialling abilities might have got them into the stage’s top 10. 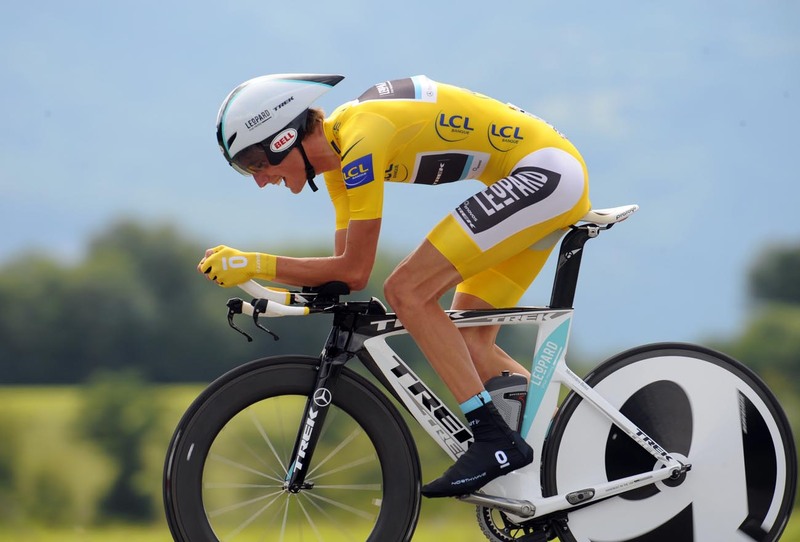 Geraint Thomas (Team Sky) admitted that “it’s been a one day too many for me” as he pedalled to 46th position, 4-24 down. 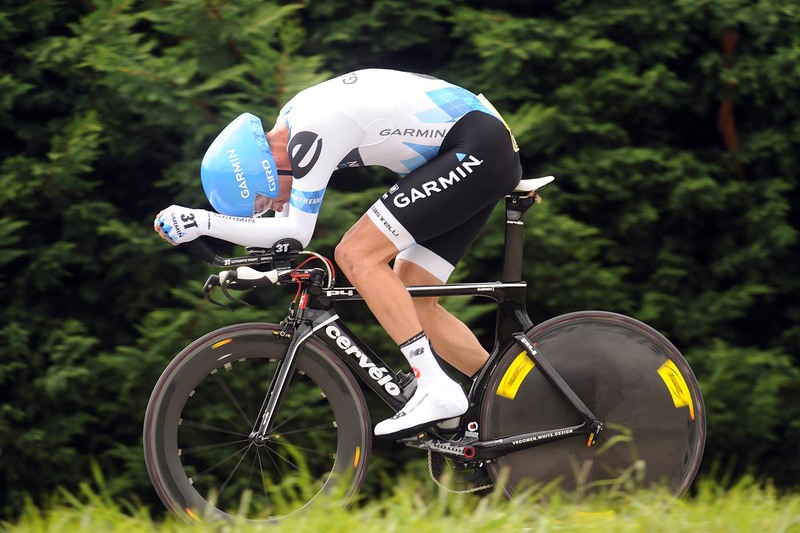 David Millar (Garmin-Cervelo), meanwhile, finished 32nd, 3-41 back on Martin. He has contracted bronchitis in the last few days, and said afterwards that he couldn’t compete at his usual level.